When 17th-century astronomers first turned their telescopes to Jupiter, they noted a conspicuous reddish spot on the giant planet. This Great Red Spot is still present in Jupiter's atmosphere, more than 300 years later. It is now known that it is a vast storm, spinning like a cyclone. Unlike a low-pressure hurricane in the Caribbean Sea, however, the Red Spot rotates in a counterclockwise direction in the southern hemisphere, showing that it is a high-pressure system. Winds inside this Jovian storm reach speeds of about 270 mph. The Red Spot is the largest known storm in the Solar System. With a diameter of 15,400 miles, it is almost twice the size of the entire Earth and one-sixth the diameter of Jupiter itself. The long lifetime of the Red Spot may be due to the fact that Jupiter is mainly a gaseous planet. It possibly has liquid layers, but lacks a solid surface, which would dissipate the storm's energy, much as happens when a hurricane makes landfall on the Earth. However, the Red Spot does change its shape, size, and color, sometimes dramatically. 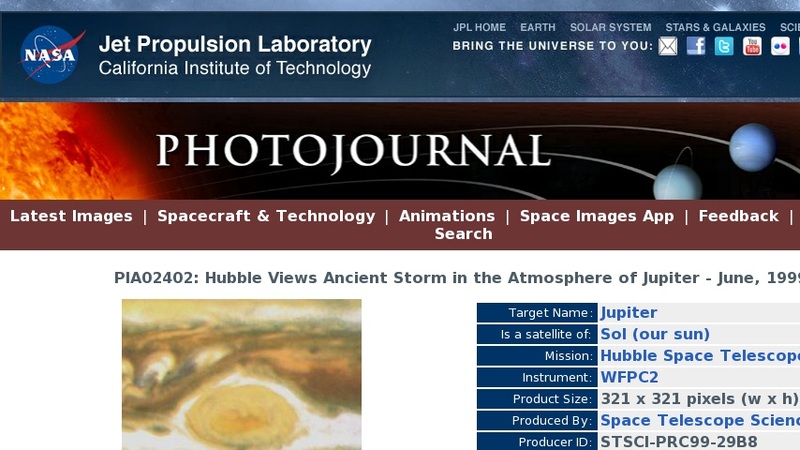 Such changes are demonstrated in high-resolution Wide Field and Planetary Cameras 1 & 2 images of Jupiter obtained by NASA's Hubble Space Telescope between 1992 and 1999(PIA01594 thru PIA01599 and PIA02400 thru PIA02402). This image was obtained in June 1999. A montage representing the entire series of images was prepared by the Hubble Heritage Project team and is available atPIA01593. Astronomers study weather phenomena on other planets in order to gain a greater understanding of our own Earth's climate. Lacking a solid surface, Jupiter provides us with a laboratory experiment for observing weather phenomena under very different conditions than those prevailing on Earth. This knowledge can also be applied to places in the Earth's atmosphere that are over deep oceans, making them more similar to Jupiter's deep atmosphere.